146 Willow Street was originally built as a grand single-family home. 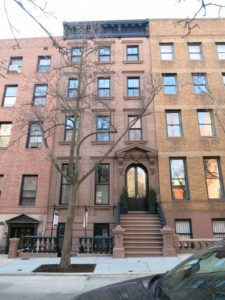 In the mid-20th-century the house underwent a massive renovation that included chopping the interior up into many apartments, removing most of the original detail, relocating staircases, and stripping the façade of much of its original detail to include the stoop. The owner’s goal when purchasing 146 Willow was to provide a spacious single family home, as well as restore the original character of the house, and to include restoration of the façade and installing a new stoop and bluestone sidewalk. Although Passive House was not part of the original set of goals, many of the attributes of doing a Passive House were. This included an incredibly quiet interior atmosphere, continuous fresh air creating a healthy interior environment, and minimal mechanical equipment throughout. What makes 146 Willow so exciting is that we were able to achieve a certified passive house for the same initial build price as compared to similar construction of this quality. This proves that you can complete a certified Passive house while fully restoring a landmark home. This is a significant game changer for homeowners who may not have ventured down the passive house path, and is essential for creating more energy efficient buildings. First Passive House Plus Certified In The U.S.